The Good, the Bad, and the Ugly was a regular column written by SP Clarke for Two Louies magazine. From 1990 through 2005 SP reviewed more than fifteen hundred local recordings, with thousands of bands and musicians cited by name. Future stars and also-rans experienced SP’s microscopic insights and impartial criticisms. Every major act to emerge from the Portland music scene received SP’s close inspection, and in almost every case, his prediction for success. 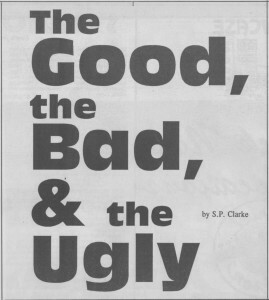 While Two Louies discontinued operations in 2005, SP Clarke has maintained his GBU column in Buko magazine, since 2007. GBU did not appear in every monthly issue of Two Louies every year. Some years will not have twelve columns.Currently, we have the GBU columns from the years 1991-2005 posted and we will eventually post the remainder going back to 1990, and beyond, as the opportunity presents itself. Where possible we have provided links to the bands website and BUY links to websites that still have the recordings for sale.